It’s officially beach season in Barcelona. It’s May, but everywhere I go I hear the same thing, “The summer is finally here! It is here to stay!” I agree, it looks as if the rain and cold of this last winter and spring is really gone for good, and it’s time to dust off the bikini, dip myself in sunscreen, and seize the day at the beach. Not much of a believer in ‘the early bird catches the worm’, I tend to head for the beach later in the day, around 2:30pm, or lunch time. Some say this is the worst time to be at the beach, that this is when the UV-rays are most penetrating, but if you have a sun-umbrella then it doesn’t much matter. I take my lunch with me to the beach, rent a lawn chair and sun-umbrella, and eat my picnic while watching the soft waves of the Mediterranean roll in. Life is good. 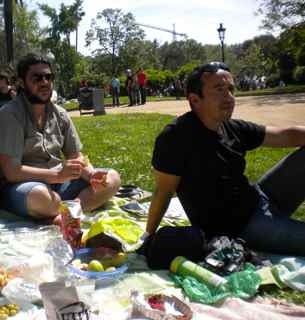 If you too want to have a picnic at the beach, but don’t have a kitchen in Barcelona, not to worry. Here are three superb spots that do take away near Barcelona’s shoreline, Barceloneta. 1)Yamane – Asian. Only take-away located in El Born, which is a 10 minute walk from the port and the beach. Here you can choose between tight sushi rolls, Teriyaki, curries, and even some Thai dishes. About 10 Euros per person depending on how much sushi you can eat. 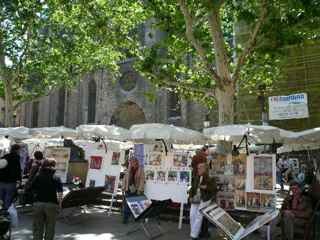 2) Sant Carles 13 – Mediterranean. I love this place. If you go, you may see me there ordering the stuffed eggplant. Usually they have a veggie option. It’s deli style and for 6 Euros you will get three courses, wrapped up and ready for the seashore. 6 Euros is the special, drinks are more. 3) Born Seleccio – Mediterranean, Gourmet, Asian. Also in the Born, this shop carries gourmet products from Spain and has a deli. A sushi platter will cost you 8.00 Euros and is ample. 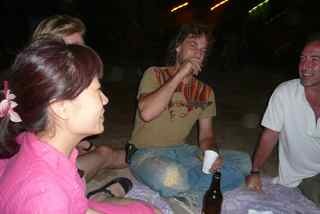 They also have traditional pasta dishes, and beverages. 8.00 Euros for the special, and up. San Remo is tiny, but in this case, size doesn’t matter. This charming little Pension is right in the city center in Barcelona’s Eixample neighborhood, one of the best in the city. This area is safe, elegant, central, and offers lots in the way of cafes, markets, shops and restaurants. Family-run, San Remo’s caretakers, Rosa Maria, lives on-site, meaning there is always someone around to help you and the vibe is a bit more B&B than hotel. All of the rooms at Remo have TV’s, AC, heating, and full bathrooms. They are simple, but tasteful and clean. There are just 8 rooms at Remo, so if you want to stay here in busy summer months or weekends, then book in advance. The price is right at Remo, which is probably why it is often full. A single goes for 38 Euros and a double for 48 Euros. There is also an Internet station available for guests, and a cafe on the corner for morning coffees and chocolate croissants. Staying at Remo, you will also be a stone’s throw away from Passeig de Gracia, where many Gaudi buildings line the street as well as museums such as the Tapies Museum and Palau Robert. From your base at Remo, you’ll be able to walk to most place in the center with little effort. Most hotels in the center of Barcelona start at 80 Euros a night and then rise swiftly from there. If you are a couple you couple easily expect to pay 50 Euros each a night in the city for accommodations in a normal hotel. However, if you are open to going without a few conveniences, such as an in-room bathroom, then there are deals to be had in Barcelona, and money to be saved! A single room with a shared bathroom at Hostal Lausanne goes for just 24 Euros a night – which considering, is a pretty sweet deal. In many places around the city, you will pay the same 24 Euros for a single bed in a shared dormroom with 20 other smelly backpackers. Sure, the bathroom is shared, but think of it as staying with relatives in a huge house, after all, Hostal Lausanne is family-run. If you just can’t deal with having to share the shower with strangers (not at the same time of course), then pay a bit more at Lausanne and get a single with an in-suite bathroom for 35 Euros or a double for 48 Euros. 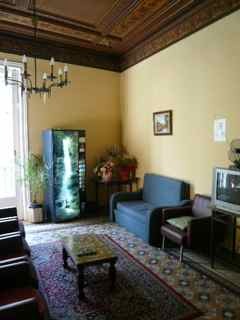 Hostal Lausanne is right in the center of the city, a few blocks off Plaza Cataluna. Here you will be near the Metro, buses, airport bus, many restaurants and many of Barcelona’s most important sites. 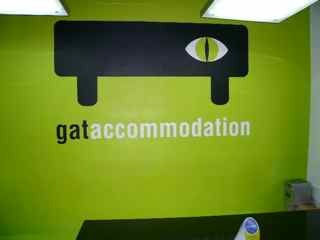 Gat Rooms is a hotel chain that has hostels and hotels all over Europe. With two hotels in Barcelona, Gat Xino and Gat Raval, you have two budget options with this cool company in the Catalan capital city. Gat means Cat in Catalan and a slick green cat’s eye is the logo for this modern chain. I say chain, but Gat Room is no Best Western, they are completely unique, a bit bohemian, and definitely design. Gat Xino’s rooms have flat-screen TV’s, original artwork, comfy beds, balconies, and modern well-equipped bathrooms. I often forget about these Gat Rooms when I have people coming to visit me here in Barcelona, but really, aside from Fashion House they are my favorite budget options in Barcelona. It is only fair to mention the neighborhood that Gat Xino is in. El Raval, the barrio where you’ll find these hotels-hostels, is not everyone’s cup of tea. It is a bit rough around the edges in parts, and it is best to stay on the main streets where there are tons of happening bars, restaurants, cafes and eclectic shops. There’s a University in El Raval and the vibe here is young, arty, alternative…I like it and if you are up for some late nights of bar hoping, then going out in El Raval and staying in Gat Xino will make your evening easier. Staying at Gat Xino you are also near the MACBA and CCCB, Barcelona’s contemporary art museums. Valentine’s Day is not celebrated in Spain (OK, it is celebrated by some, but it is an import holiday, like Halloween). 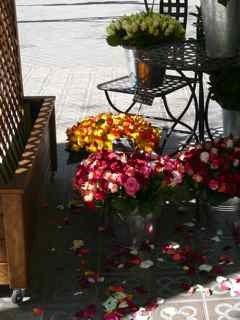 In Barcelona, the most romantic day of the year is not in February but in the springtime, on the 23rd of April. Today is Sant Jordi’s Day (St. George’s Day, from St George and the Dragon, remember? ), and it is one of my favorite Catalan holidays. Instead of having chocolates and valentines, men give the important women in their lives one single red rose, and women give the men in their lives a book. Clearly, this is not an even trade off, and nowadays women may also get books, but men don’t seem to be getting any roses. I believe that the secret to long-lasting love is the element of surprise and romantic getaways (and all that communicating and compromise stuff, too). This St Jordi’s if I was trying to impress my main-squeeze I would take him or her to Boutique Hotel Neri for a romantic dinner and a night of bubble baths and cava in one of their deluxe suites. 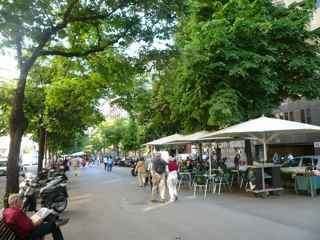 Neri is located in Barcelona’s old Jewish Quarter on one of the quietest and most enchanting plazas in the city. Located inside a 18th century palace, a stay at this fabulous hotel will make you feel like the king or queen you are, at least for one evening. The hotel has 22 rooms, 3 of which are Jr Suites and 1 Suite. If staying at Neri, you will be close to where all the action is today. On St. Jodi’s Day, the streets of Barcelona fill with lovers, young and old, plus rose vendors and authors signing books and shops selling books along the streets. This is one romantic day you will not want to miss. 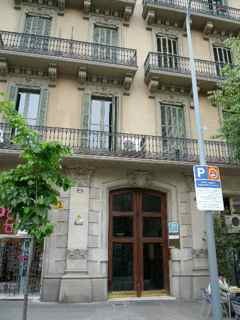 I live in Barcelona, and so am opinionated about hotels in the city. There are many, and indeed, it can be hard to choose. My Barcelona hotel rules are to stay clear of La Rambla, and Pl. Catalunya, because these areas are overpriced and noisy. But Hotel Praktik breaks my rules. It is right in the center of the city, and its gorgeous. It is also a boutique hotel, and I have a special love for boutique hotels, because they are intimate and often unique. 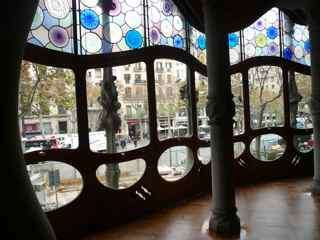 Barcelona is known for its Modernista architecture, which was Gaudi’s style. Praktik Hotel is located in a Modernista building designed by architect Villar i Comona, and is right down the street from some of the city’s most important Modernista sites. Those who love art and architecture will feel at home at Praktik Hotel. The rooms at Praktik are reasonably priced and at the time of this writing the hotel was offering specials on rooms starting at 80 Euros, which is a pretty good deal for the center of the city. Though this area is touristy, staying at Praktik guests will be close to the metro, bus, train and many bars and restaurants.